A year after Kathy graduated from nursing school, she decided she wanted to do more with her life. She was looking for excitement, enrichment and a way to serve her country. She loved the military, she loved the uniform and all it meant and she wanted the opportunity to become an Air Force nurse. Kathy dreamed that one day she would be a flight nurse in the Air Force, flying with wounded soldiers back to the United States from Vietnam or from one military hospital to another within the country so they could get the care they needed. Kathy was commissioned a Second Lieutenant and went to the Homestead Air Force Base, where she served in the military hospital. Then her life arrived at a crossroad: She could pursue her dream to be a flight nurse or she could begin a family with the soldier she had fallen in love with and married. Unable by military rules to stay in the Air Force after having children, she chose her family and retired from the Air Force in 1967. In 1989 the Army was hoping to recruit Kathy's first daughter, Lisa. Lisa had no interest in enlisting, but as Kathy listened to the recruiter her dream, long dormant, resurfaced. She looked at the recruiter and asked, "How about me?" Within months Kathy was in the Army Reserve, serving one weekend a month and two weeks of active duty during the summer. 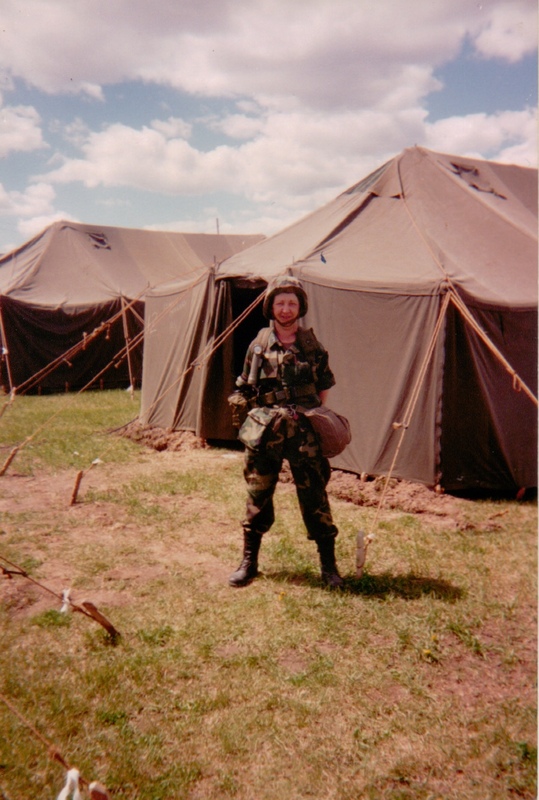 One of the first requirements asked of her was to submit a written plan for child care for her second daughter should Kathy's unit be called to serve overseas. One of Kathy's summer sessions was spent setting up a Mobile Army Surgical Hospital, a MASH unit, to prepare for possible deployment. It was hard, strenuous work, but it was also fun because of the team effort required. This exercise became real one summer when Kathy was assigned to Tripler Army Medical Center in Hawaii, which was established in 1907 and served as the medical center for all the casualties in the Pacific in World War II. The surgical suite at Tripler was being remodeled, bit by bit, and a MASH unit had been set up in tents on its grounds to perform overflow surgeries until the renovation was complete. There weren't enough active duty nurses at Tripler to cover both locations, so some Army Reserve nurses, including Kathy, had a unique experience during their summer duty. In 1999 Kathy's mother came to live with her. Kathy again put family first and retired from the Army Reserve, realizing that her mother needed her at home.